"Vancouver to Orchards to Sifton Streetcar Line, Vancouver, Washington"
A photograph in the Clark County Historical Museum's collection names this man as being George Wall. 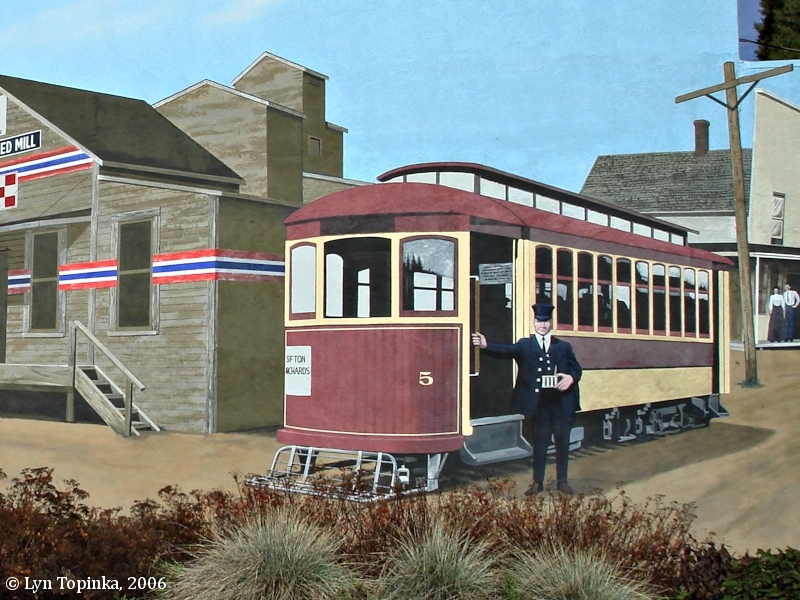 The Vancouver to Orchards to Sifton streetcar line, or "electric trolley", was a line which ran from downtown Vancouver north, and then east to the small communities of Orchards and Sifton. 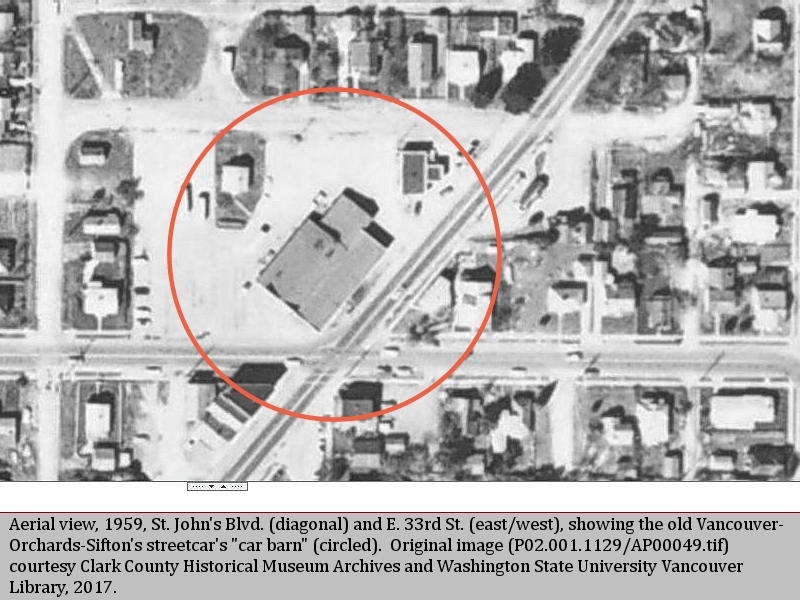 The streetcar's "car barn" was located at 33rd and St. Johns where the eastern portion of the line headed east on 33rd, crossing Burnt Bridge Creek, Falk Road, Stapleton Road, and then heading northeast, parallelling the north side of Fourth Plain through Orchards Park and ending in Sifton. 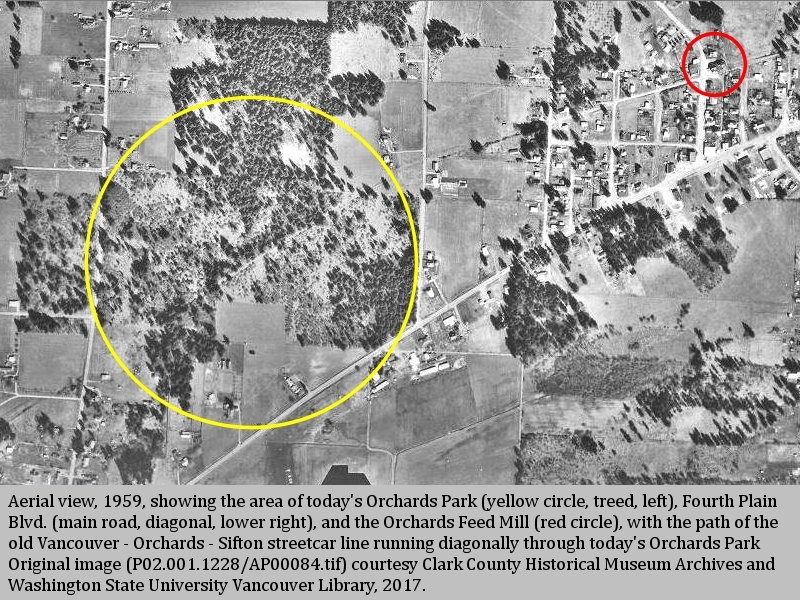 The Battle Ground's The Reflector (October 15, 2003), states the Sifton-Orchards Streetcar use to make 10 stops from Vancouver to Orchards to Sifton, including the Orchards Feed Mill, the oldest building still standing in the Orchards area. p.60 ... "In 1905 the Lewis and Clark Centennial Exposition opened in Portland. ... Work had already begun on the railroad bridge, and the North Bank line was under construction. 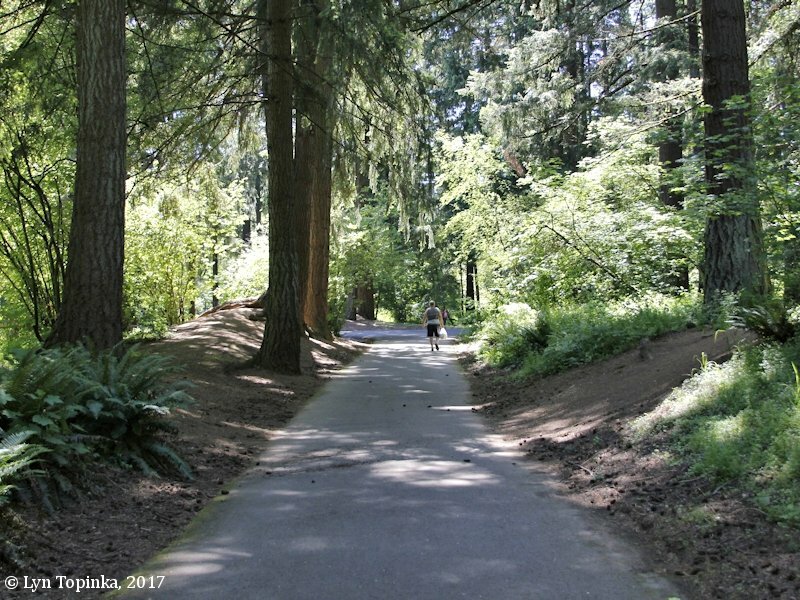 At the same time Vancouver began laying tracks for a streetcar line that would reach Orchards and Sifton; it opened on September 26, 1908." 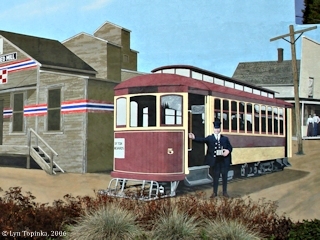 p.73 ... "The Orchards Sifton streetcar line opened with great fanfare on September 26, 1908. The route from Vancouver roughly followed today's State Route 500. The line lasted until 1925, carrying not only passengers, but freight from the river to Orchards." "With the announcement that James J. Hill was going to build the Spokane, Portland and Seattle Railway through Vancouver in 1895, the area's prosperity was renewed. A number of franchise seekers vied for the opportunity to build a street railway in Vancouver, and in 1906 Walter H. Moore was granted permission. Before the line's construction was completed, Moore went bankrupt in the recession of 1907. A group of Vancouver men took over building it until 1908 when the Vancouver Traction Company was formed. This firm completed the line and operation commenced that year. In 1910 a subsidiary, the Clarke County Development Company was incorporated to build an interurban line east of town to Orchards and Sifton, an area in which they had real estate interests. The system did not pay as the investors had hoped, and in 1911 it was sold to the Washington - Oregon Corporation, a utility holding company. It managed the line until forced into receivership in 1914. In 1920 the line reached its highest ridership, serving over one million passengers that year. It dropped off rapidly thereafter, and in 1923 the system was sold to the Puget Sound Power and Light Company of Seattle. In spite of several fare increases, the line was still losing money, and in 1926 ceased operation." A route map in David Warren Freece's "A history of the street railway systems of Vancouver, Washington, 1889-1926" (1984, Master's Thesis, Portland State University) shows the eastern section of Vancouver to Orchards to Sifton line beginning in Vancouver on 33rd Street (location of the "Car Barns") west of St. Johns Blvd., crossing Burnt Bridge Creek to Falk (at Falk Road) and then to Stapleton (at Stapleton Road). From there the line curved northeast, the stops being Sparks, Jaggy, Roney (Rooney), Bonzo, Hartfield, Parkway, Orchards, Gher (Gehr), and ending at Sifton. The tracks were located to the north of Fourth Plain Blvd. Today Washington State Route 500 follows nearly the same route. 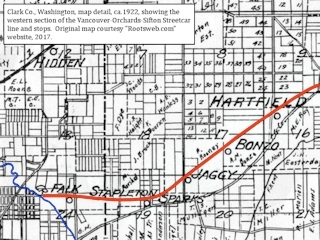 According to the "Ninth Annual Report of the Public Service Commission of Washington to the Governor" (1919, State of Washington), the Vancouver - Orchards - Sifton line was 5.52 miles in length from the eastern edge of the Vancouver city limits, and 8.87 miles in length from the Interstate bridge. The line of railway known as the Sifton line ... extends from the city limits of Vancouver eastward to the station of Sifton, a distance of 5.52 miles from the east city limits, from said city limits into the city of Vancouver a distance of 3.35 miles, making a total length of line of 8.87 miles from Sifton station to the approach of the interstate bridge in Vancouver." During the last week in August 2017, a 108-foot-long, 28-inch high tapestry was on display at the Vancouver Barracks. This 70-panel tapestry, finished in 2005, depicts the history of Vancouver, Washington. Panel 39 is about the Vancouver to Orchards to Sifton Streetcar line. 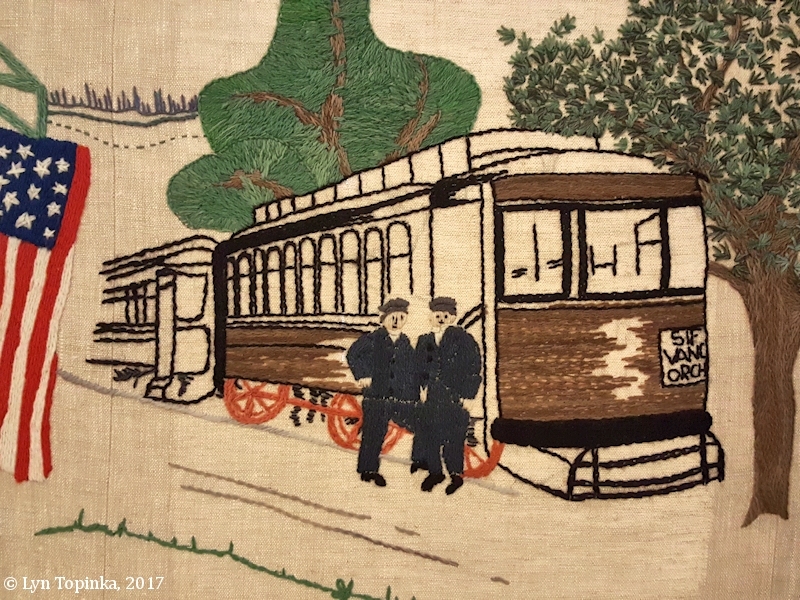 Click image to enlarge "Streetcar", Vancouver Tapestry, Vancouver Barracks, Fort Vancouver, Washington. Image taken August 24, 2017. With the financial arrangements settled, the task of building the line soon started. First the route had to be carefully selected. From the car barns the line was to run due east, crossing Burnt Bridge Creek at about one-quarter mile, continuing east for another mile and then turning northerly for the remainder of the distance. For most of this distance the line was to run just a few hundred feet north of Fourth Plain Road. The rights of way were acquired from the land owners for one dollar each in most cases. On Sunday, March 24, 1910, the line was opened from the car barns to Jaggy Road (now N.E. Andresen Road) and many people crowded the cars to try it. Unfortunately, there was a problem with a lack of power and many of those who came to ride were not able to do so while others were several hours on the ride. Source: David Warren Freece, 1984, "A history of the street railway systems of Vancouver, Washington, 1889-1926", Master's Thesis, Portland State University. 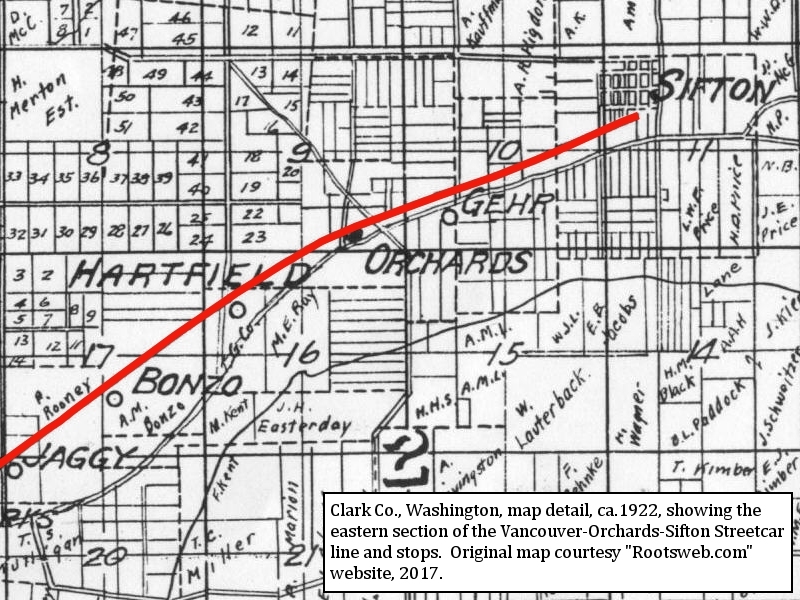 Click image to enlarge Detail, ca.1922, Clark County map showing the western section of the Vancouver-Orchards-Sifton Streetcar line, with stops (red). Burnt Bridge Creek is in blue. Original map courtesy "Rootsweb.com" website, 2017. 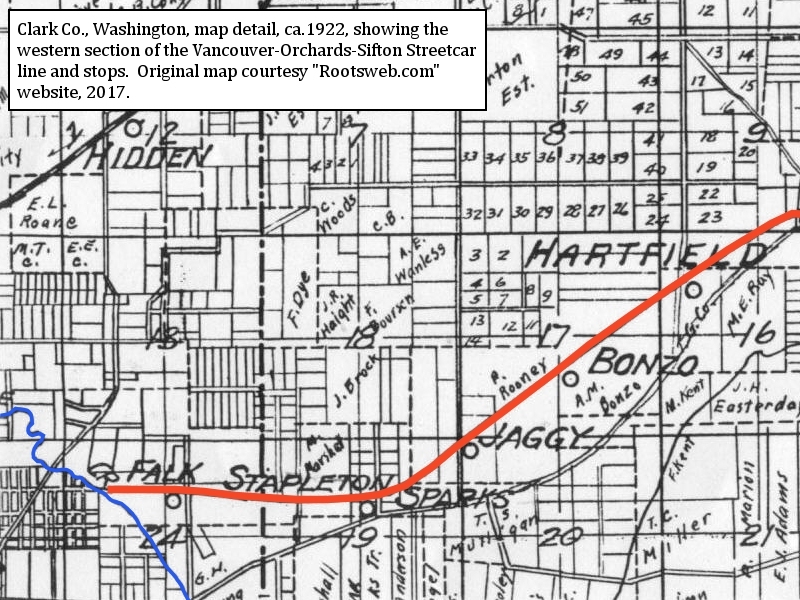 Click image to enlarge Detail, ca.1922, Clark County map showing the eastern section of the Vancouver-Orchards-Sifton Streetcar line, with stops (red). Original map courtesy "Rootsweb.com" website, 2017. 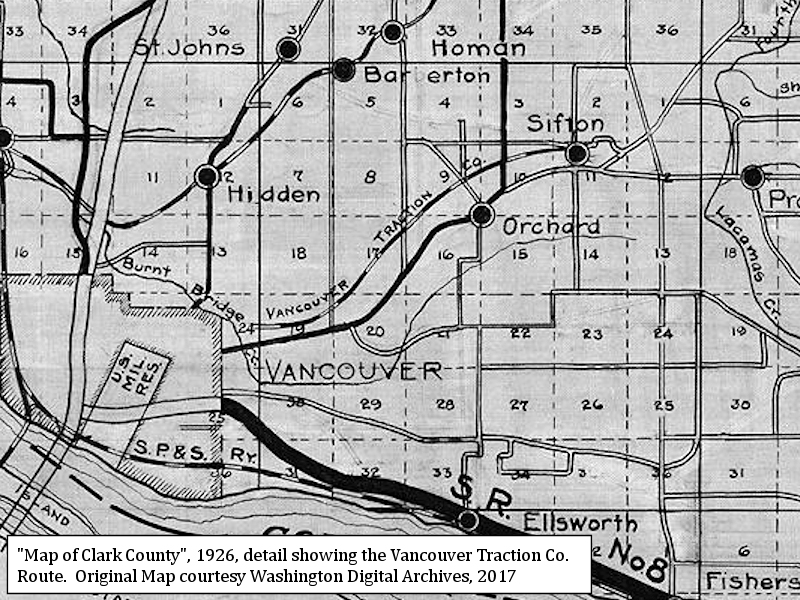 Click image to enlarge Detail, 1926, Clark County map showing the route of the "Vancouver Traction Company" line. Original map courtesy Washington Digital Archives website, 2017. Vancouver to Orchards to Sifton Streetcar Line, etc. 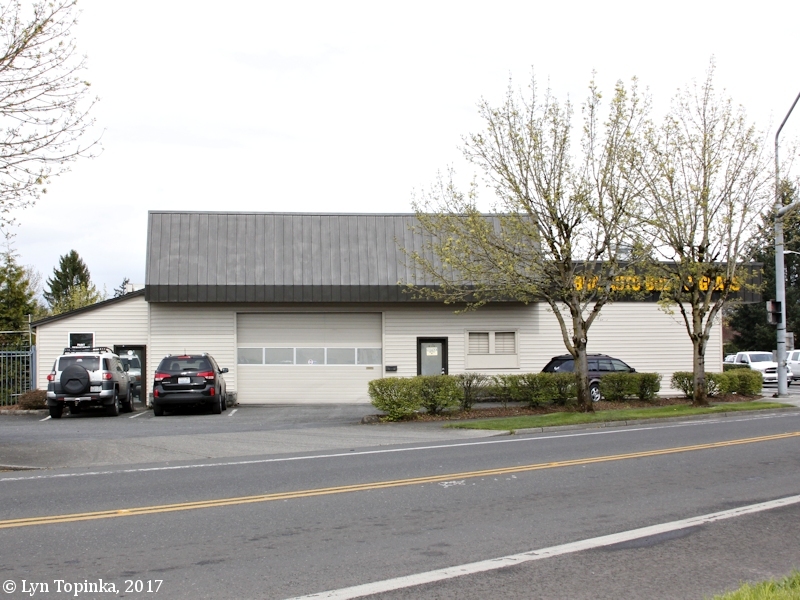 "After the system ceased operation, the car barn at Thirty-third and St John Boulevard was used as a bus barn for many years. Now it houses an auto body shop." 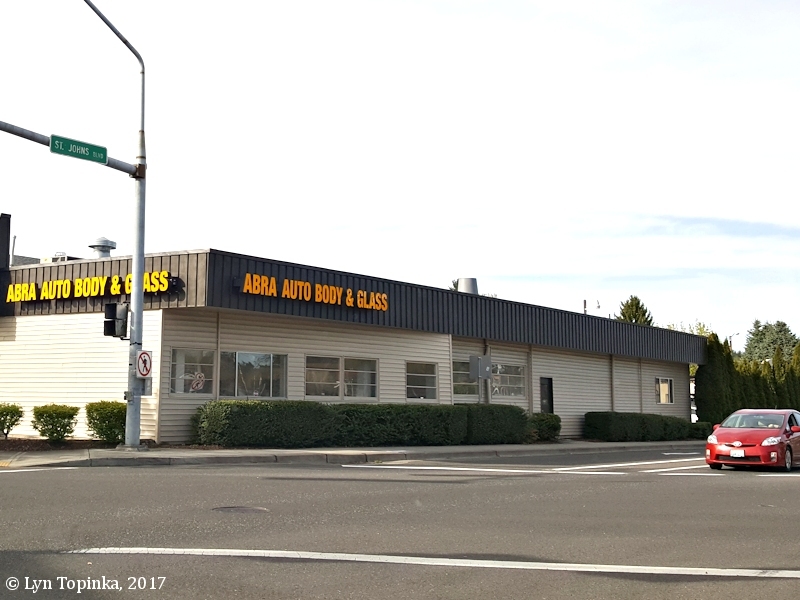 Click image to enlarge 33rd St. view, former streetcar "car barn", today ABRA Auto Body, Vancouver, Washington. Northwest corner of 33rd and St. Johns. Image taken April 13, 2017. Click image to enlarge St. Johns Blvd. 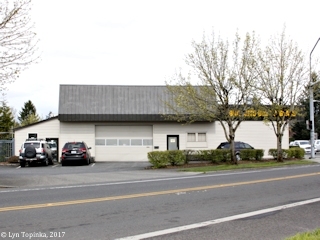 view, former streetcar "car barn", today ABRA Auto Body, Vancouver, Washington. Northwest corner of 33rd and St. Johns. Image taken April 21, 2017. Click image to enlarge St. Johns Blvd. 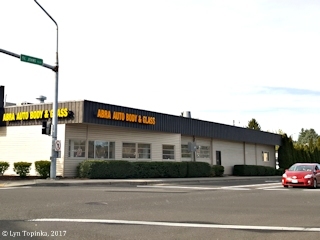 view, former streetcar "car barn", today ABRA Auto Body, Vancouver, Washington. Northwest corner of 33rd and St. Johns. Image taken May 28, 2018. Click image to enlarge Detail, 1959, aerial photo, northwest corner (circled) of St. Johns Blvd. (diagonal) and E. 33rd St. (east/west), Vancouver, Washington. 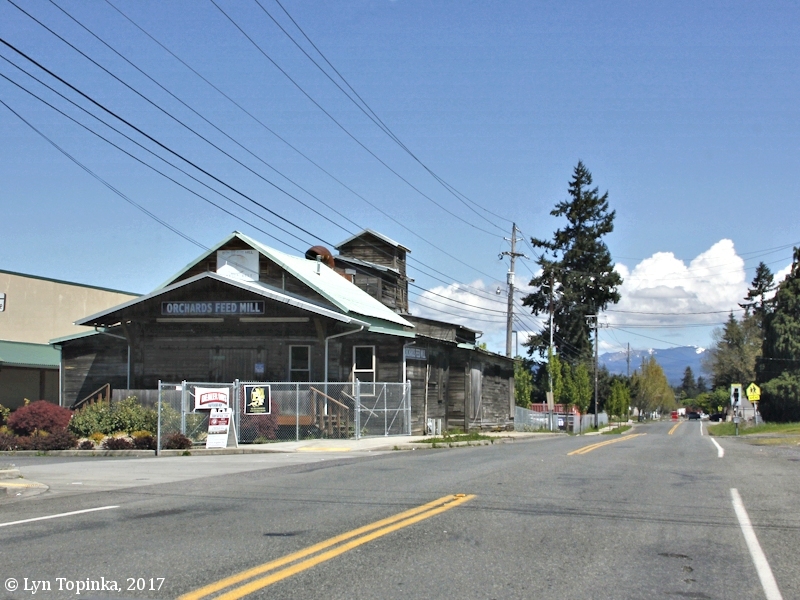 View showing the old Vancouver - Orchards - Sifton "car barn". Original image (P02.001.1129/AP00049.tif) courtesy Clark County Historical Museum Archives and Washington State University Vancouver Library, downloaded April 2017. 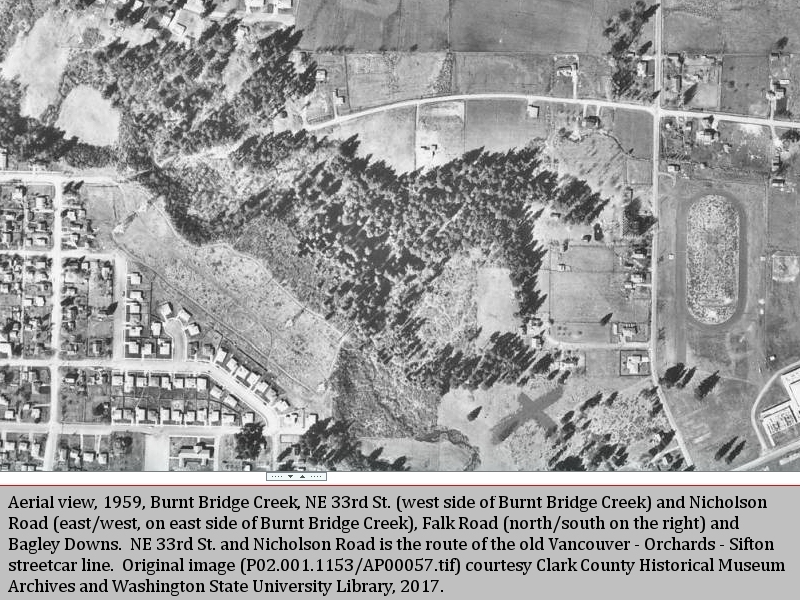 From the car barn, the old Vancouver - Orchards - Sifton streetcar line headed east along today's NE 33rd Street to Burnt Bridge Creek where it crossed the creek on a no-longer-in-existence trestle, connecting on the other side to today's Nicholson Road. 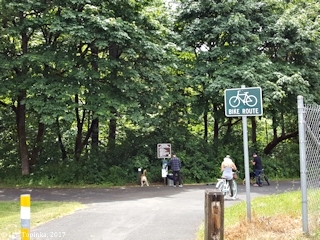 Click image to enlarge NE 33rd Street heading east towards Burnt Bridge Creek, Vancouver, Washington. Image taken August 24, 2017. "Burnt Bridge Creek ... A creek of many names. At one time, when a bridge crossed the creek at 4th Plain, it was called Bridge Creek. Then the bridge burned. In the 1850s, it was also called Stenegier’s Creek, after a Hudson’s Bay employee on whose land the creek ran. In 1865, it appears on the maps as Marble Creek, for Ansil Marble, on whose land it then lay. However, by 1885, it appears as Burnt Bridge Creek. 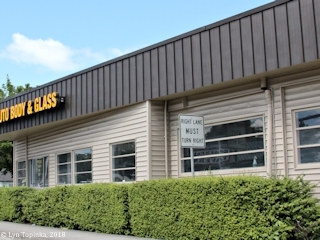 The stream was Vancouver’s primary water source until the city’s wells were dug. ."
"After the system ceased operation, the car barn at Thirty-third and St John Boulevard was used as a bus barn for many years. 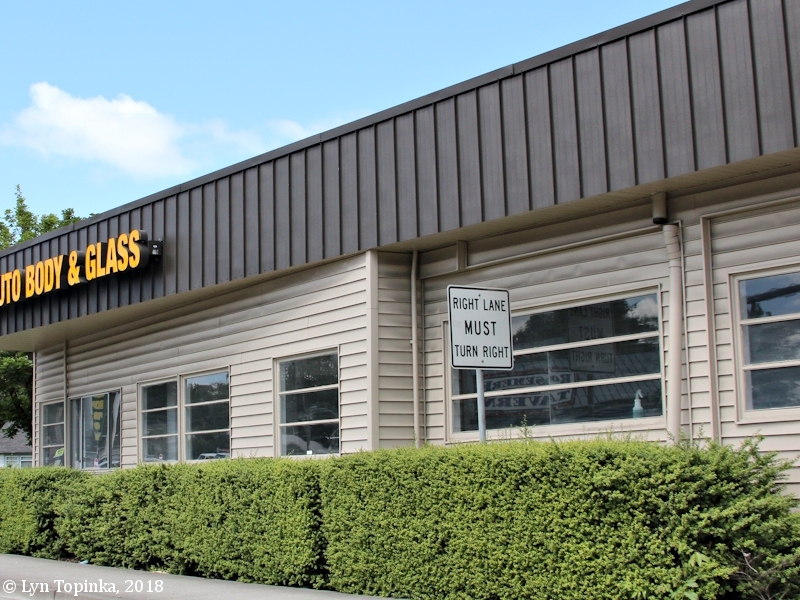 Now it houses an auto body shop. The trestle on Burnt Bridge Creek has long disappeared, but one can follow parts of the old right of way on Nicholson Road and N.E. Rosewood Avenue." 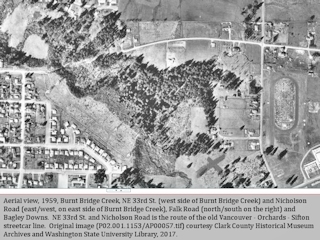 Click image to enlarge Detail, 1959, aerial photo, Burnt Bridge Creek and Bagley Downs, Vancouver, Washington. View showing Burnt Bridge Creek, NE 33rd St. (west side of Burnt Bridge Creek) and Nicholson Road (east/west, on east side of Burnt Bridge Creek), Falk Road (north/south on the right) and Bagley Downs. 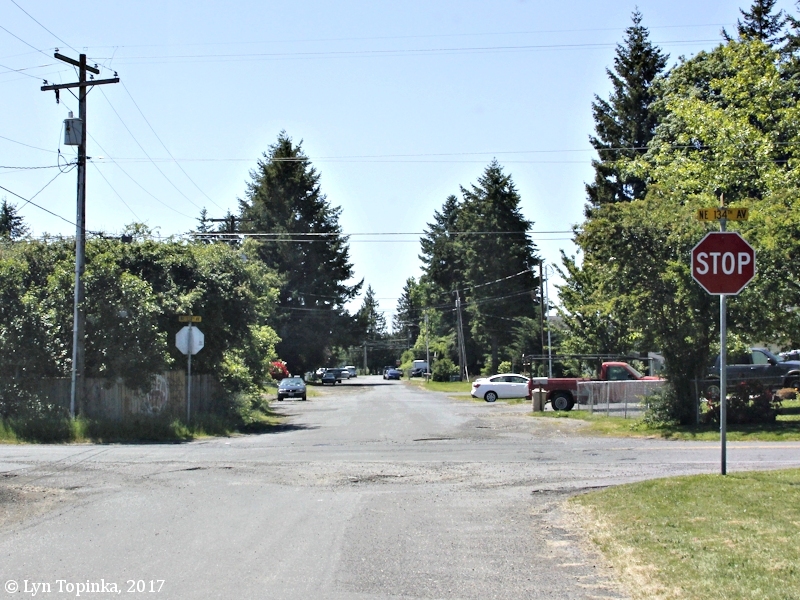 NE 33rd St. and Nicholson Road is the route of the old Vancouver - Orchards - Sifton streetcar line. Original image (P02.001.1153/AP00057.tif) courtesy Clark County Historical Museum Archives and Washington State University Vancouver Library, downloaded April 2017. 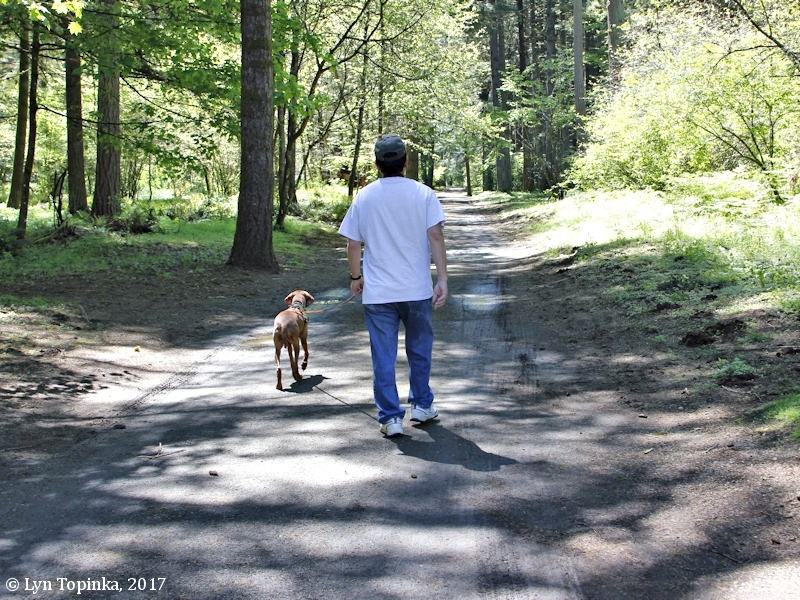 Click image to enlarge East end of 33rd Street, at Burnt Bridge Creek, Vancouver, Washington. Image taken April 21, 2017. 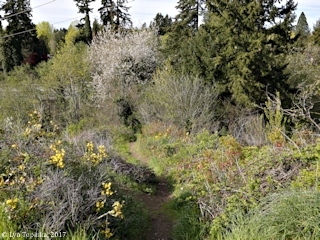 Click image to enlarge East end of 33rd Street, trail down to Burnt Bridge Creek, Vancouver, Washington. Image taken April 21, 2017. "VANCOUVER, Wash., Oct. 17. -- (Special.) -- The first bridge on the first suburban electric line extension being built by the Clark County Development Company is now rapidly nearing completion, and the day when one may get on the trolley at the foot of Washington street, at the Columbia River ferry, or at the depot, and ride out into the country, seven miles, to the temporary terminus, Sifton, is set not later than November 15. A piling bridge now being constructed is the largest on the extension, and is 864 feet in length and about 75 feet from the ground at the highest point. The bridge spans Burnt Bridge Creek, a quarter of a mile outside of the city limits, and the same distance from the present terminus of the streetcar system. It is being constructed by W.D. Smith, the contract price being $8000. ..."
Source: Morning Oregonian, March 18, 1909, courtesy Historic Oregon Newspapers Archives, University of Oregon Libraries, 2017. "VANCOUVER, Wash., Oct. 19. -- (Special.) -- "The electric line to Sefton, seven miles east of Vancouver, will be completed and in operation, and cars running on schedule time out of Vancouver within 30 days, if the equipment, which has been ordered, arrives," said W.J. Patterson, president of the Vancouver Traction Company, today. The bridge over Burnt Bridge Creek is now completed, except the decking, which is being put on, and the builder, W.D. Smith, stated to day that he expected to complete the contract by October 28. The bridge will then be ready for the steel rails." Source: Morning Oregonian, October 20, 1909, courtesy Historic Oregon Newspapers Archives, University of Oregon Libraries, 2019. "VANCOUVER, Wash., March 13. -- (Special.) -- More than two miles of the Clark County Suburban Railway has been completed on the line to Sifton, six miles east of Vancouver. This stretch is being used by work trains, and all material for the remaining four miles of road is being moved to the front from the railroad yards. The bridge across Burnt Bridge Creek has been completed at a cost of $8000, and much grading has been done on the right of way from the Jaggy road to Sifton. Between Orchards and Sifton, one mile, the line is graded and the ties laid. ..."
Source: Morning Oregonian, March 14, 1910, courtesy Historic Oregon Newspapers Archives, University of Oregon Libraries, 2017. Nicholson Road runs from Burnt Bridge Creek east to Stapleton Road. It once was the path of the Vancouver to Orchards to Sifton Streetcar tracks. "After the system ceased operation ... The trestle on Burnt Bridge Creek has long disappeared, but one can follow parts of the old right of way on Nicholson Road and N.E. 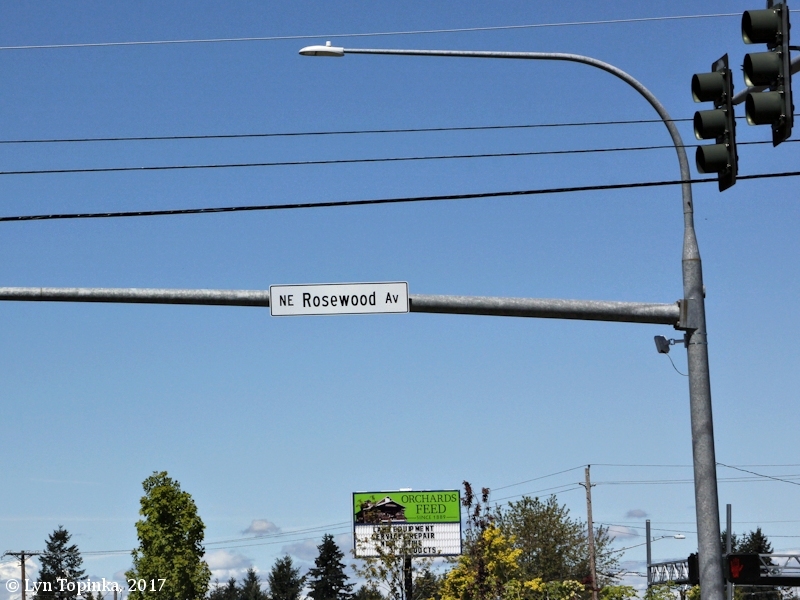 Rosewood Avenue." 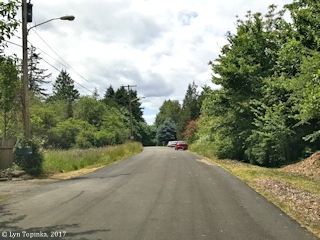 Click image to enlarge Nicholson Road, heading west towards Burnt Bridge Creek, Vancouver, Washington. Image taken June 4, 2017. Click image to enlarge Nicholson Road dead end, east of Burnt Bridge Creek, Vancouver, Washington. Image taken June 4, 2017. 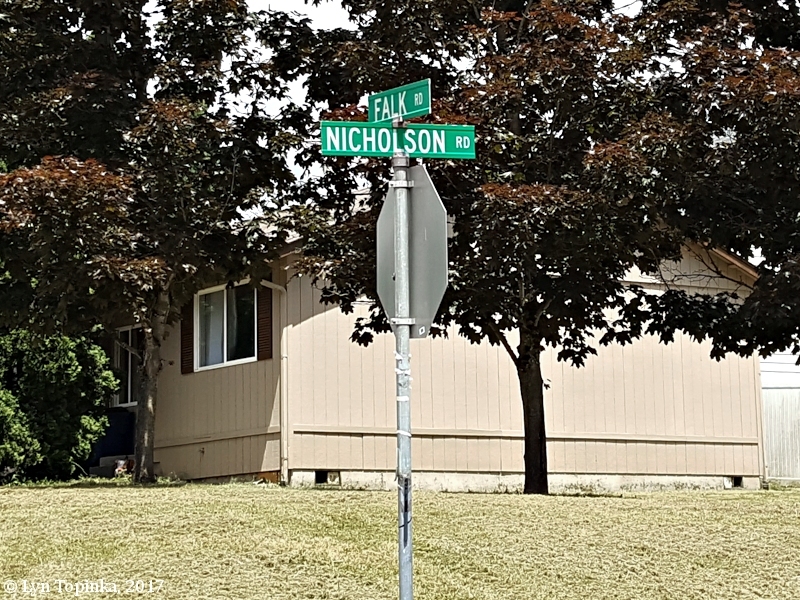 Falk Road, also known as NE 42nd Avenue, runs north south and was named after the Falk family who held Donation Land Claims (DLC) on property the road ran through. "Falk ... C.H. Falk donated 10 acres for a fairground on Fourth Plain Road, near the road that now carries his name. The Clark County fair was located there for awhile; then the area was used for a racetrack for horses and dogs called Bagley Downs. 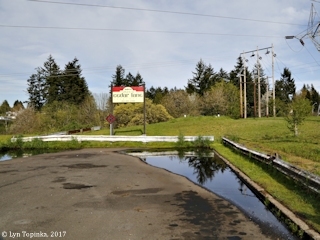 People who wanted to go to the fair or the races took the streetcar to Falk, a station on the edge of Mr. Falk’s property, at about where SR 500 is today. The name stayed on the map for about 15 years after the railway stopped running." 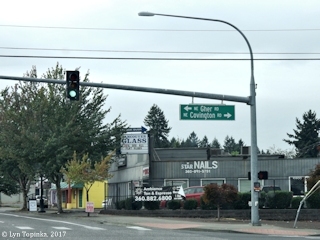 Click image to enlarge Falk and Nicholson Roads junction, looking at southwest corner, Vancouver, Washington. Image taken June 4, 2017. 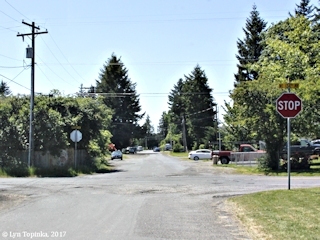 Click image to enlarge Nicholson Road at Falk Road, looking east down Nicholson, Vancouver, Washington. Image taken August 24, 2017. The U.S. Bureau of Land Management's General Land Office (GLO) Records database (2017) shows George A. Falk being granted title to 160 acres of T1N R3E, Section 14, on June 25, 1900 (1862 Homestead EntryOriginal). William Elmgren Left Unconscious on Sifton-Stapleton Car. "VANCOUVER, Wash., June 8, -- (Special.) -- When William Elmgren, conductor-motorman for the North Coast Power Company, was running the Sifton car on the line between Stapleton and the carbarns, the sole passenger hit him on the head and robbed him of about $3 and his money changer. Two hours later, John Elmgren, operating another car, missed his brother and taking another car, he found the victim unconscious in his car at Falk Station. The injured man remembers nothing after he heard his passenger walking towards the front of the car after he had got on at Stapleton. Sheriff Biesecker was notified by telephone, but the robber had two hours the start and could have taken one of several train towards Seattle." Source: "Morning Oregonian", June 9, 1916, courtesy Historic Oregon Newspapers Archives, University of Oregon Libraries, 2017. 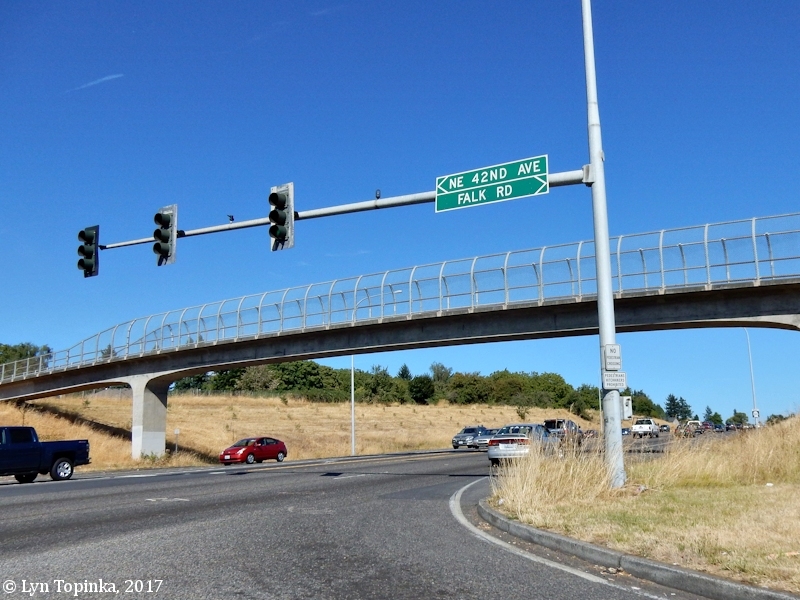 Click image to enlarge Falk/42nd junction with State Route 500, Vancouver, Washington. 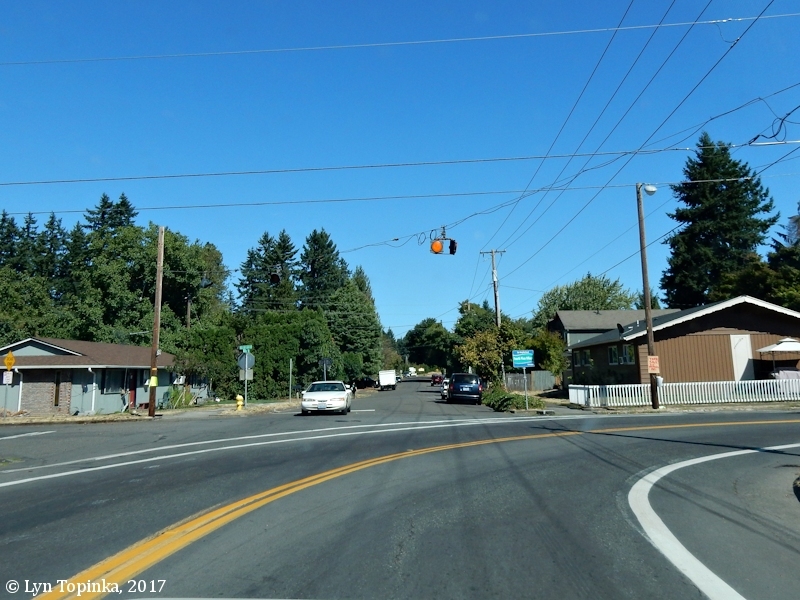 The Falk/42nd junction with SR500 is less than 1/4 mile north of the location of the historic streetcar line. View looking to the southwest. Image taken July 4, 2017. Click image to enlarge Falk/42nd junction with State Route 500, Vancouver, Washington. The Falk/42nd junction with SR500 is less than 1/4 mile north of the location of the historic streetcar line. View looking to the northeast. Image taken August 24, 2017. "The Clarke County Fair Association determined to take advantage of the interurban line shortly after it began operating. In the spring of 1911, ten acres were purchased on the Falk tract, east of Burnt Bridge Creek, and developed into a fairgrounds. The Washington - Oregon Corporation constructed a loop through the fairgrounds to facilitate the loading and unloading of passengers, and during the fair maintained a service from the ferry to the site every twenty minutes. The 1912 fair was quite successful for the railway but, according to railway manager George W. Ford, the 1913 one was lackluster and did not attract nearly as many people. He attributed this to the fact that the fair manager for this second year was a preacher who had "cut out everthing he could of a sporting nature, which injured attendance to a great extend." Nevertheless fair week proved a profitable time for the railway." Harvest Show Folk Buy Land. "VANCOUVER, Wash., June 20. -- (Special.) -- The Clark County Harvest Show Association will have 24 acres of land, along the trolley line to Sifton, instead of ten acres, as first planned. The price paid for the land will be $375 an acre. About $10,000 of the capital stock of the association has been sold, leaving $5000 more of which to dispose." Source: Morning Oregonian, June 21, 1911, courtesy Historic Oregon Newspapers Archives, University of Oregon Libraries, 2017. 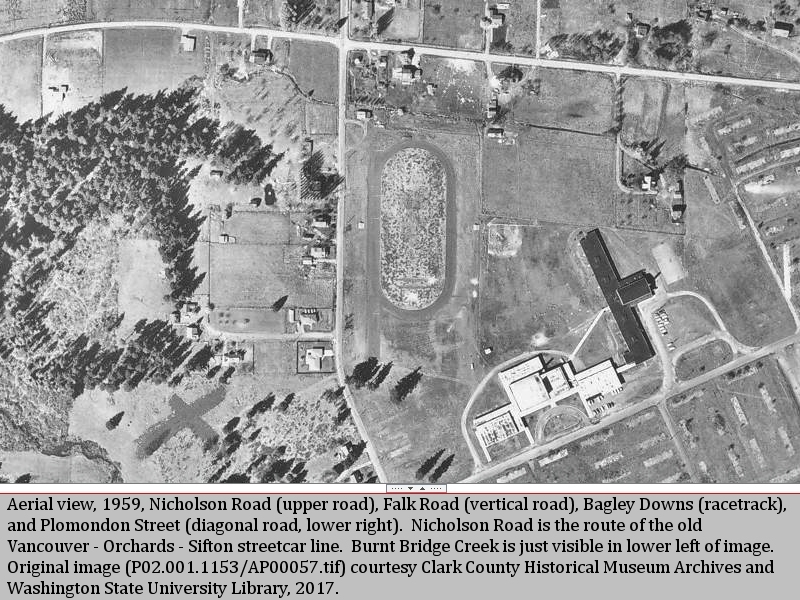 "Bagley Downs ... Bert Bagley Jr. built a race track on his dairy farm at Fourth Plain Boulevard and Falk Road to spice up the Clark County Fair that made its home there until 1928. When the fair moved north, Bagley continued to race horses, and eventually dogs, to great controversy." Click image to enlarge Detail, 1959, aerial photo, Nicholson Road, Falk Road, and Bagley Downs, Vancouver, Washington. View showing Nicholson Road (upper road), Falk Road (vertical road), Bagley Downs (racetrack), and Plomondon Street (diagonal road, lower right). Burnt Bridge Creek is just visible in lower left of image. 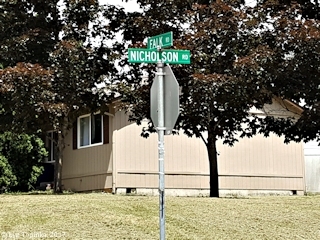 Nicholson Road is the route of the old Vancouver - Orchards - Sifton streetcar line. Original image (P02.001.1153/AP00057.tif) courtesy Clark County Historical Museum Archives and Washington State University Vancouver Library, downloaded July 2017. 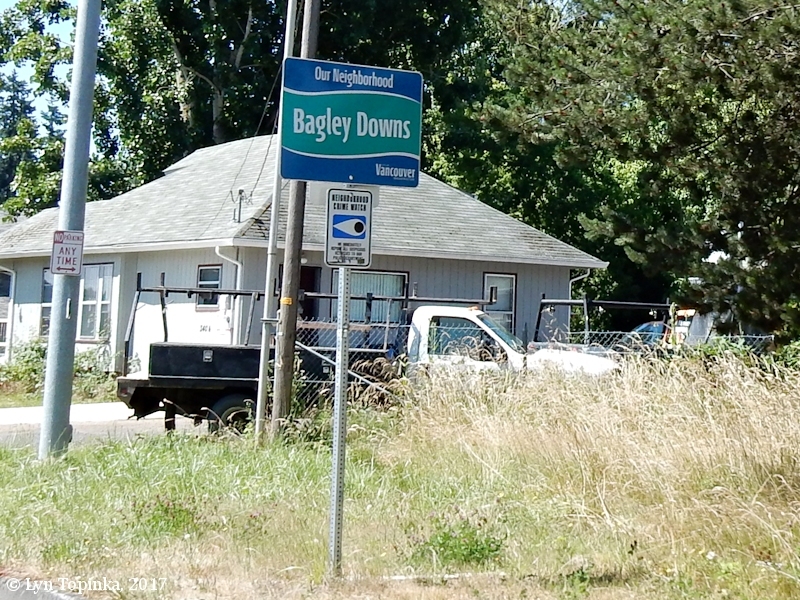 Click image to enlarge Bagley Downs Neighborhood, Vancouver, Washington. Image taken July 4, 2017. 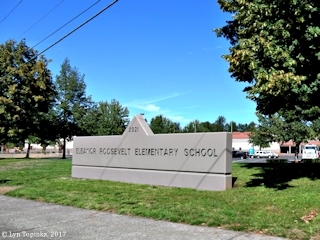 Click image to enlarge Eleanor Roosevelt Elementary School, Vancouver, Washington. 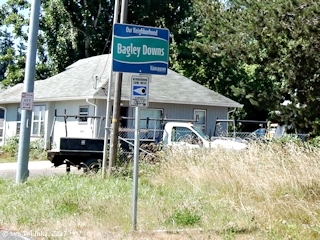 Once the location of the Bagley Downs Racetrack. Image taken August 24, 2017. NE Stapleton Road, also known as NE 54th Avenue, was presumably named after two prominent Stapleton brothers who were involved in shaping Vancouver in the late 1800s and early 1900s. George W. Stapleton, a lawyer, served three terms as Mayor of Vancouver in the 1880s before moving to Oregon and eventually becoming a Judge. James P. Stapleton, George's younger brother, worked in his brother's law office in downtown Vancouver before branching himself into local politics. "Judge [George W.] Stapleton is a lawyer of the old school, having been admitted to the bar in 1886. 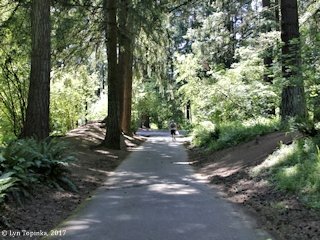 He engaged in the practice of law at Goldendale, Wash., until 1890, when he moved to Vancouver Wash., and formed a partnership with A.L. Miller, then District Attorney of Clarke County. During his residence in Vancouver he served three terms as Mayor. In 1895 he formed the partnership of Moody, Doovert and Stapleton in this city and moved to Portland in April, 1989." Source: "Morning Oregonian", August 30, 1917, courtesy Historic Oregon Newspaper Archives, University of Oregon Libraries, 2017. "WANTED -- Woman who can milk and tend to milk; good house and reasonable hours. Ford Jersey Dairy, 1 mile east of Vancouver, Stapleton station." Source: "Morning Oregonian", May 30, 1922, courtesy Historic Oregon Newspapers Archives, University of Oregon Libraries, 2017. 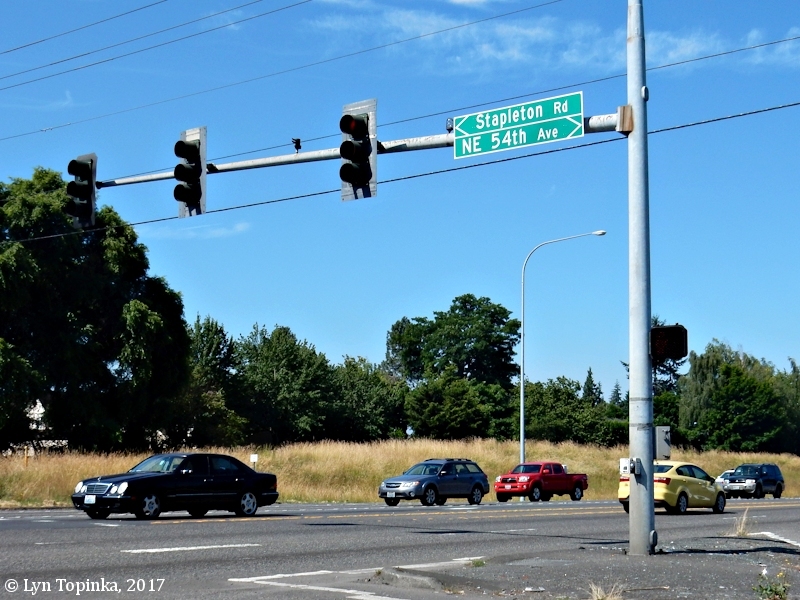 Click image to enlarge Stapleton/54th junction with State Route 500, Vancouver, Washington. The Stapleton/54th junction with SR500 is less than 1/4 mile north of the location of the historic streetcar line. View looking to the southwest. 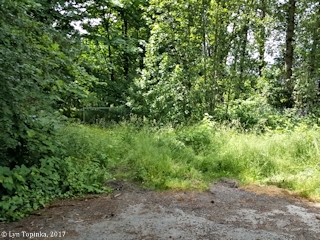 Image taken June 30, 2017. The U.S. Bureau of Land Management's General Land Office (GLO) Records database (2017) shows Jerusha Sparks (and Heirs of Andrew Bolen [Bolon] and Jerusha Bolen [Bolon]) being granted title to 73.78 acres of T2N R1E, Sections 16 and 22, on November 21, 1881 (1850 Oregon-Donation Act). "From the Baker City Democrat: "In 1853, Andrew J. Bolen and wife, now Mrs. Jerusha Sparks of this city, settled upon a donation claim -- 640 acres -- near Vancouver, W.T. Mr. Bolen was Indian Agent at or near Spokane Falls, and, in the discharge of his duties, was killed by Indians in the Fall of the year 1855. Nearly ever since that time Mrs. Sparks has been contesting in some form or other, in the courts or before the Interior Department, her right to said lands. Two years ago she employed L.O. Sterns of this city to attend to her interests, who, after taking it to the Secretary of the Interior on appeal twice, has finally obtained the decision of that officer in favor of Mrs. S. The land is very valuable, as a part of the town of Vancouver is built upon it, and it is largely and extensively improved. Mrs. Sparks is to be congratulated on her victory; besides, it shows that she is a woman of pluck and deserving of it. It is proper to say that Hon. J.H. Mitchell argued the case before Secretary Schurz, who signed the decision in person. This decision gives her nearly six-sevenths of about 400 acres of land, which ought to make the deserving old lady comfortable the remainder of her days."" Source: "The New Northwest", April 21, 1881, courtesy Historic Oregon Newspapers Archives, University of Oregon Libraries, 2017. Honor to be Paid to A.J. Bolon, Murdered by Indians. "A monument in honor of Andrew J. Bolon, Indian agent for Washington Territory when Isaac L. Stevens was Governor, will be unveiled at 11 A.M. today on the spot where he was murdered by Indians, 15 miles from Goldendale, Wash. September 22 was the 63d anniversary of the murder. Mr. Bolon was born in Pennsylvania. Four Indians assassinated him while he was traveling alone frome the Yakima Indian Reservation to The Dalles, Or." Source: "Sunday Oregonian", October 6, 1918, courtesy Historic Oregon Newspapers Archives, University of Oregon Libraries, 2017. "FOR SALE -- Mallard ducks. L.A. Fiser, Sparks station, Wash. Take Sifton car." Source: "Sunday Oregonian", August 31, 1913, courtesy Historic Oregon Newspapers Archives, University of Oregon Libraries, 2017. In March 1910, the Vancouver to Orchards to Sifton streetcar line was open from Vancouver to Jaggy Station. The U.S. Bureau of Land Management's General Land Office (GLO) Records database (2017) shows John Jaggy (with Henry B. Lamb and Michael Bear) being granted title to 160 acres of T1N R4E, Section 2, on August 3, 1866 (1855 Scrip Warrant Act) and John Jaggy being granted title to 80 acres of T3N R1E, Section 14 on August 1, 1872 (1820 Sale-Cash Entry). The Oregonian For 50 Years. John Jaggy, of 1014 Main street, Vancouver, Wash., has been a subscriber to The Oregonian since its first publication as a daily. Both he and Mrs. Jaggy were born in Switzerland, but came to American in 1854 and arrived in Portland by vessel in December of 1857. Mr. Jaggy, who is now 82 years of age, was for many years a prosperous merchant of Vancouver. He has in his possission copies of several early issues of The Oregonian, containing accounts of great events. Among these is the paper that chronicled the assassination of Abraham Lincoln. ..."
Source: Morning Oregonian, February 4, 1911, courtesy Historic Oregon Newspapers Archives, University of Oregon Libraries, 2017. Widow of Late Vancouver Pioneer Passes Away at 87. "Vancouver, Wash., July 4. -- (Special.) -- Mrs. Margaret Wintler Jaggy, widow of the late John Jaggy, died at her home, Eleventh and Main streets, at 2 o'clock this morning. She was 87 years old, and until a few months ago was out in her flower garden and very active for one of her age. The funeral will be held from the home at 2 o'clock tomorrow afternoon, the Rev. J.M. Canse officiating." Source: Morning Oregonian, July 5, 1913, courtesy Historic Oregon Newspapers Archives, University of Oregon Libraries, 2017. VANCOUVER PIONEER LAID TO REST IN 88TH YEAR. Six Men Who Had Once Been Sunday School Pupils of Esteemed Woman Serve as Pallbearers. In 1869 Mrs. Jaggy came to Vancouver with her husband. She became a member of the Methodist Church of Cascades, W.T., in 1864. She is survived by two daughters ... and a son, J.H. Jaggy, a business man of this city, and one brother, J.J. Wintler, of this city ..."
Source: Sunday Oregonian, July 6, 1913, courtesy Historic Oregon Newspapers Archives, University of Oregon Libraries, 2017. Cows Killed by Wild Beast Five Miles From Vancouver. "VANCOUVER, Wash., Aug. 3. -- (Special.) -- Farmers living in the vicinity of Jaggy station, on the electric line, five miles from this city, are to stage a cougar hunt Saturday and Sunday, and every resident in that vicinity will turn out with guns and dogs to capture a large cougar which has killed two cows and a calf during the past week. ..."
Source: Morning Oregonian, August 4, 1917, courtesy Historic Oregon Newspapers Archives, University of Oregon Libraries, 2017. Homes in Vicinity of Jaggy Station Threatened by Flames. "VANCOUVER, Wash., Sept. 27. -- (Special.) -- Forest and brush fires are reported at Fern Prairie, Burton, near Camas, and on Larch Mountain. Near Burton today the fire assumed dangerous proportions and calls for help were sent to Vancouver. The fire burning at Burton last night menaced a house on the Osborne place. Many other places are in danger and fear is felt for the safety of houses and barns near Jaggy station." Source: Morning Oregonian, September 28, 1918, courtesy Historic Oregon Newspapers Archives, University of Oregon Libraries, 2017. 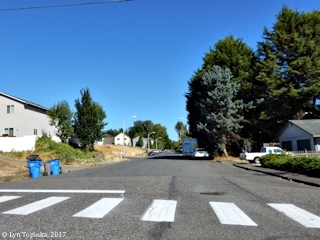 "Andresen Road ... 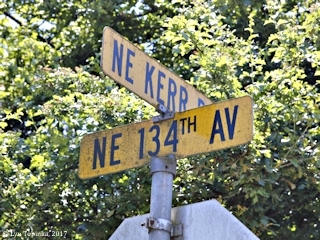 Originally 65th Avenue, this road took its name from J.T.W. Andresen and James O. Andresen, father and son, who had property on either side of the road. James Andresen was a well known veterinarian and member of the Savings and Loan board in Vancouver. He died in 1973." 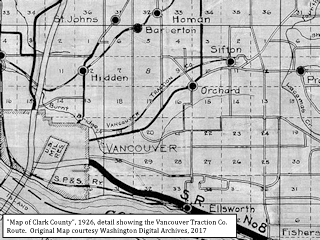 A Clark County plat map, ca.1922, shows the Vancouver - Orchards - Sifton streetcar line crossing the property of P. Rooney (T2N R2E, SW corner of Section 17, original map courtesy "Rootsweb.com", 2017). 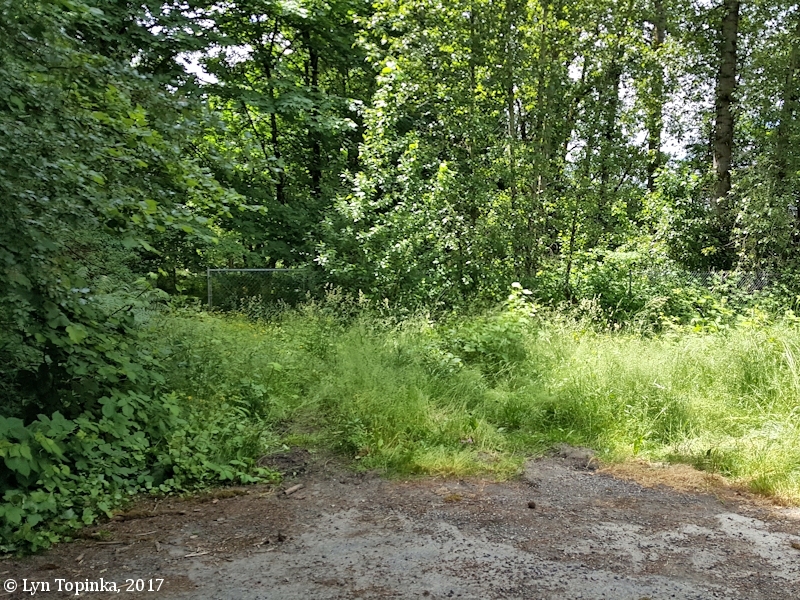 "70 acres, portion beaverdam land, on electric carline 3 1/2 miles from Vancouver on north side of track at Rooney's station. Price is right. By subdividing you can make a handsome profit." Source: Morning Oregonian, March 20, 1911, courtesy Historic Oregon Newspapers Archives, University of Oregon Libraries, 2017. "AUCTION SALE -- Dec. 9, at Rooney Station, 35 head of cows and heifers, 6 calves, 1 grade Holstein bull, 1 horse and other articles; take Orchards car at Vancouver, Wash. W.S. Wood, auctioneer." Source: "Morning Oregonian", December 9, 1913, courtesy Historic Oregon Newspapers Archives, University of Oregon Libraries, 2017. "At the "Rooney Place," 4 1/2 miles northeast of Vancouver, Wash. Take Sifton-Orchards car to Rooney station Monday, March 15, 1915, 11 o'clock A.M. sharp, 20 head of cattle, 6 Jersey, also Durham and Holstein, tubercular tested ..."
W.S. Wood, Auctioneer, Vancouver, Wash. Source: "Morning Oregonian", March 14, 1915, courtesy Historic Oregon Newspapers Archives, University of Oregon Newspapers, 2017. 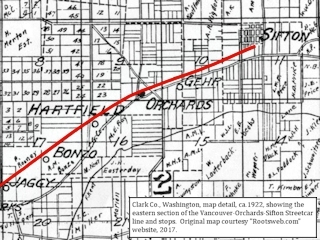 A Clark County plat map, ca.1922, shows the Vancouver - Orchards - Sifton streetcar line going through the property of A.M. Bonzo (T2N R2E, SE corner of Section 17, original map courtesy "Rootsweb.com", 2017). Orchards, Wash., 5 miles N.E. Vancouver; take Sifton-Orchards car to Bonzo station. MONDAY, JUNE 19, 11 A.M.
23 milch cows, 10 head fresh; 8 coming fresh soon, balance in Summer and Fall; an extra good herd of cows of mixed breed of Holsteins, Durham and Jersey; all tuberculin tested. Cattle only for sale; be on hand early. Terms cash unless otherwise arranged. Source: "Sunday Oregonian", June 18, 1916, courtesy Historic Oregon Newespapers Archives, University of Oregon Libraries, 2017. "YOUNG man to work on small farm, wage $36; take Orchards car at Vancouver, get off at Hartfield station, 20c fare; go north to Red barn and windmill. Vancouver, route No. 2, box 100." Source: "Morning Oregonian", February 23, 1919, courtesy Historic Oregon Newspapers Archives, University of Oregon Libraries. "$1800 CASH buys 5 acres, 4-room house, barn, 2 chicken houses, well, well house, Jersey cow, 75 chickens, 2 miles north Hartfield station, Vancouver, Wash., R. 6, Box 193." Source: "Morning Oregonian", January 4, 1920, courtesy Historic Oregon Newspapers Archives, University of Oregon Libraries. 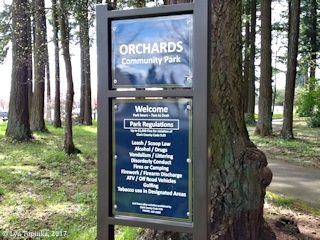 Orchards Park, located in Orchards, Washington, has been around longer than the Vancouver to Orchards to Sifton Streetcar Line. 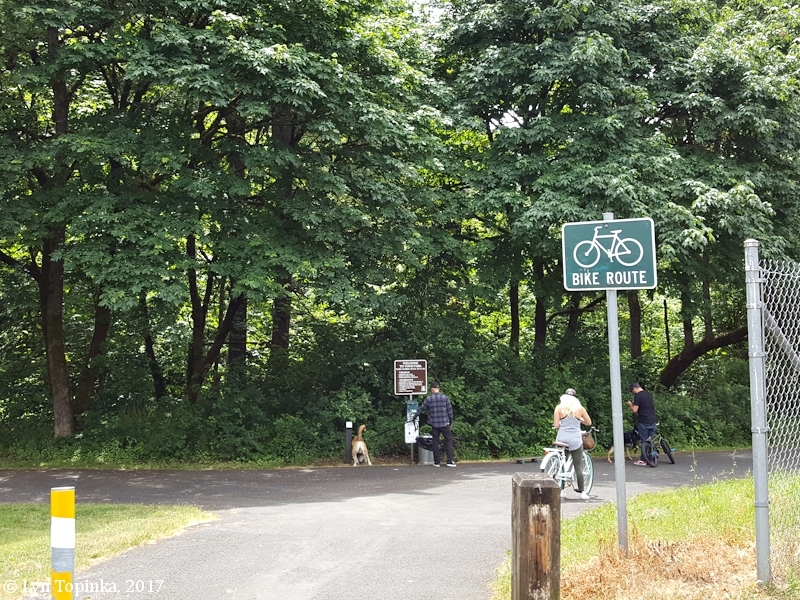 For example, "Orchards Park" was mentioned in the August 26, 1900 "Oregonian", with an announcement of a bicycle meet being postponed. 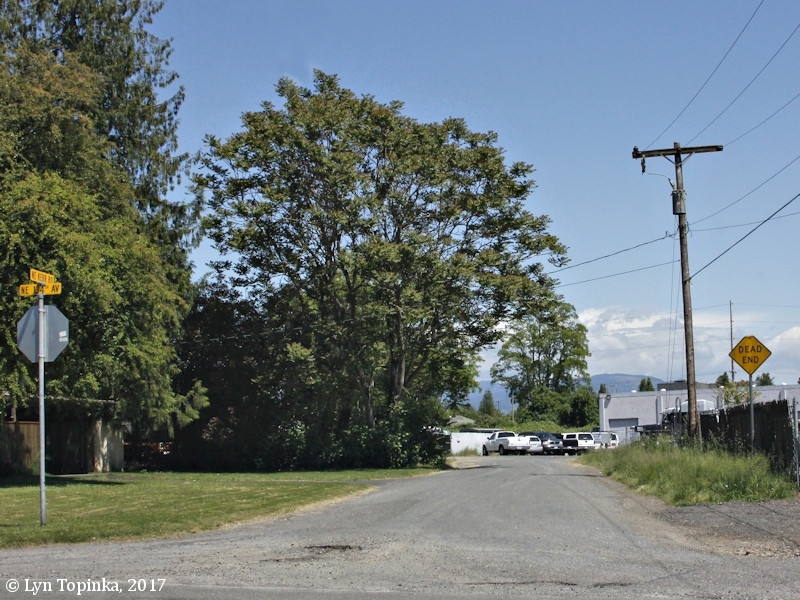 Click image to enlarge View looking southwest, probable old streetcar route through Orchards Park, Clark County, Washington. Trail runs from Orchard Park's northeast corner to its southwest corner. Image taken May 3, 2017. Click image to enlarge View looking southwest, probable old streetcar route through Orchards Park, Clark County, Washington. Trail runs from Orchard Park's northeast corner to its southwest corner. Image taken May 25, 2017. 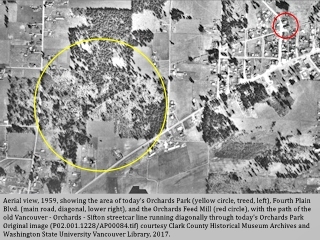 Click image to enlarge Detail, 1959, aerial photo, today's Orchards Park (yellow circle, treed area, left) and the path of the Vancouver - Orchards - Sifton streetcar tracks (cutting diagonally through park area), Vancouver, Washington. 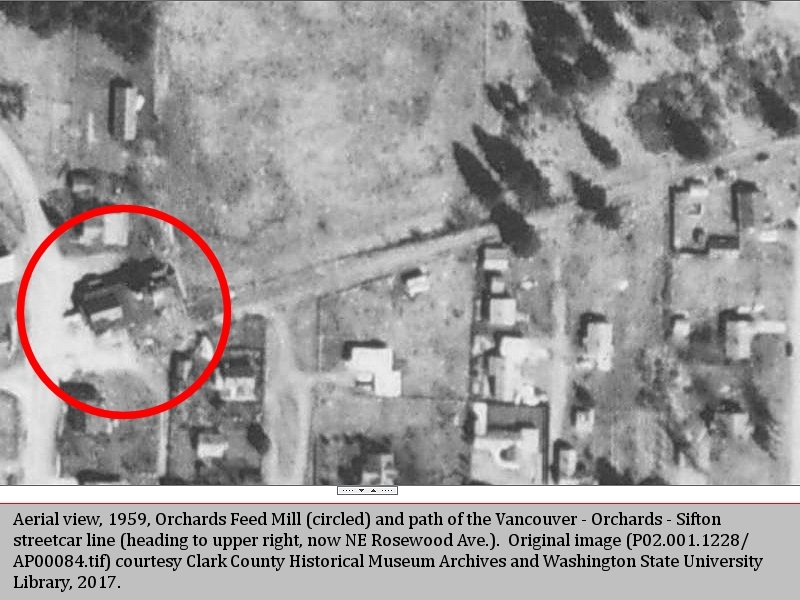 The Orchards Feed Mill is the red circle. Original image (P02.001.1128/AP00084.tif) courtesy Clark County Historical Museum Archives and Washington State University Vancouver Library, downloaded April 2017. The Vancouver to Orchards to Sifton Streetcar Line officially opened to Orchards on May 15, 2010. "Orchards ... It was formerly called Fourth Plain. When the Hudson’s Bay Co. First occupied Fort Vancouver, they numbered their grazing plains consecutively, 1-6, from their headquarters. The Orchards area was in the fourth plain. The residents of the area wanted a name that would identify them alone. There were great tracts of fruit trees there, so they chose the name Orchards in 1904." 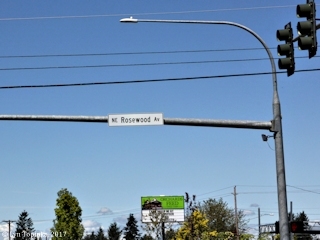 Click image to enlarge NE Rosewood Avenue sign, Orchards, Clark County, Washington. Image taken May 3, 2017. 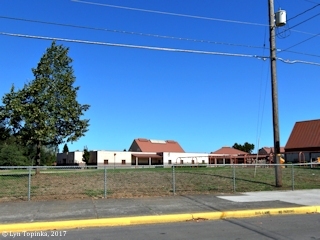 Click image to enlarge NE Rosewood Avenue looking east, at NE 107th Ave., Orchards, Clark County, Washington. 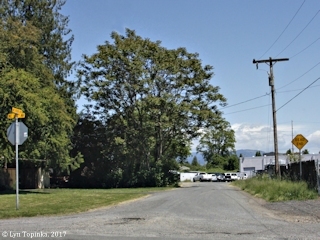 NE 109th Ave./NE Covington Road intersection, and the Orchards Feed Mill, is in the distance. Image taken May 3, 2017. 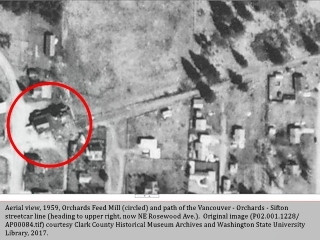 Click image to enlarge Orchards Feed Mill and NE Rosewood Avenue, looking east, Orchards, Clark County, Washington. Image taken May 3, 2017. 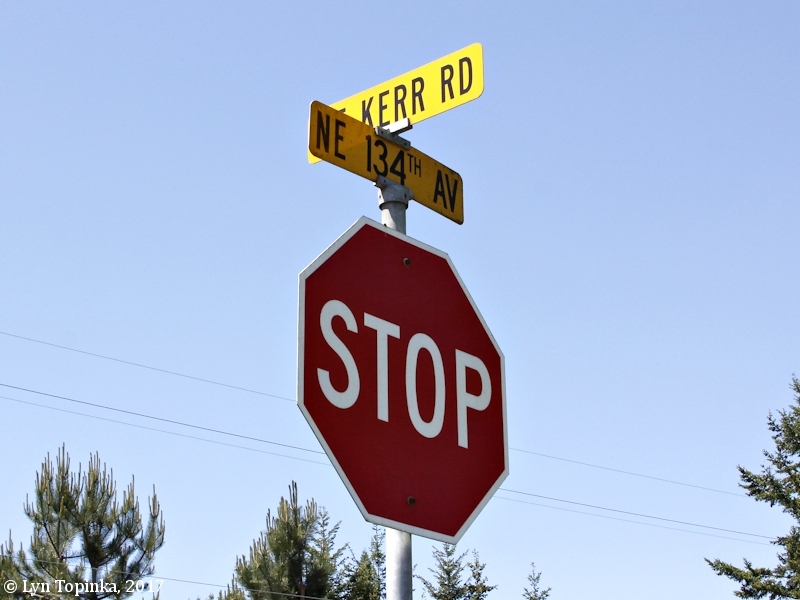 "Gehr: The name of a station stop on the streetcar which ran from Vancouver to Orchards survives in Gehr Road, which crosses SR 500 at 112th Street. Named for Joseph Gehr who was born in Pennsylvania and came to Washington in 1852. Once he reached Clark County, he and his family took out a land claim that was later purchased by Frederick Proebstel. Joseph Gehr served in the Clark County Mounted Rifles, First Regiment of Washington Volunteers, during the Indian Wars of 1855-56." 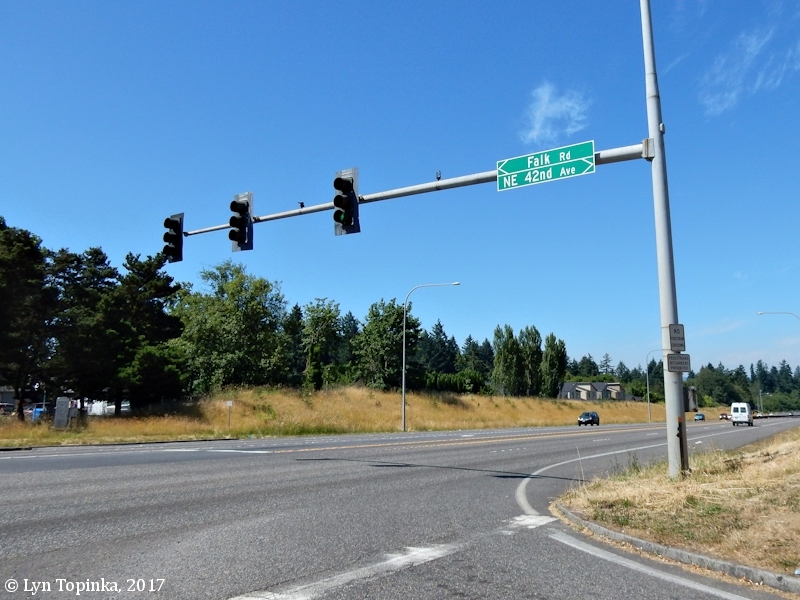 Today NE 112th Ave. angles northwest and crosses SR 500, becomes Gher Road, which, after crossing Fourth Plain, becomes NE 109th Ave., and finally at NE Rosewood it becomes NE Covington Road. 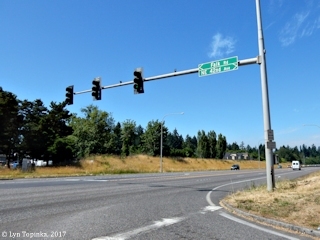 At SR500 NE 112th Ave. heads due north, crosses NE Fourth Plain Blvd. and dead-ends at NE Rosewood Ave. According to the Bureau of Land Management's General Land Office (GLO) database (2017), Joseph G. Gher was granted title to 162.85 acres of T2N R2E, Sections 9, 10, and 15, on December 22, 1865 (1850 Oregon-Donation Act). The 1888 Clarke County plat map (Library of Congress, 2017) shows the location of the "J.F. Gher" DLC being located within the southwestern edge of the Fourth Plain. Often the name "Gher" is seen misspelled as "Gehr", as found on the ca.1922 Clark County plat map ("rootsweb.com" website, 2017), the "Muster Roll of Capt. William Strong's Company (A), 1855, the 1984 Masters Thesis of D.W. Freece, and "The Columbian" article "Names In Clark County". "Gehr, Joseph E., (another list has "Joseph E. Gher"), Private, 24, Horse $150/35 reshipment, Horse & Equipments." Capt. William Strong's Company (A) was the Washington Mounted Rifles, Washington Territory, volunteers commanded by Capt. William Strong, "called into the service of the United States by Maj. G.I. Rains 4th U.S. Infy Commaning Columbia River and Puget Sound District and by Acting Governor C.H. Mason of Washington Territory at Fort Vancouver W.T. ... on the 27th day of October 1855 to serve for the term of Three Months from the data of Enrollment, unless sooner discharged. The Company was organized by Capt. William Strong at Fort Vancouver, in the month of October 1855." Middle initial ??? --- E., F., or G., ??? 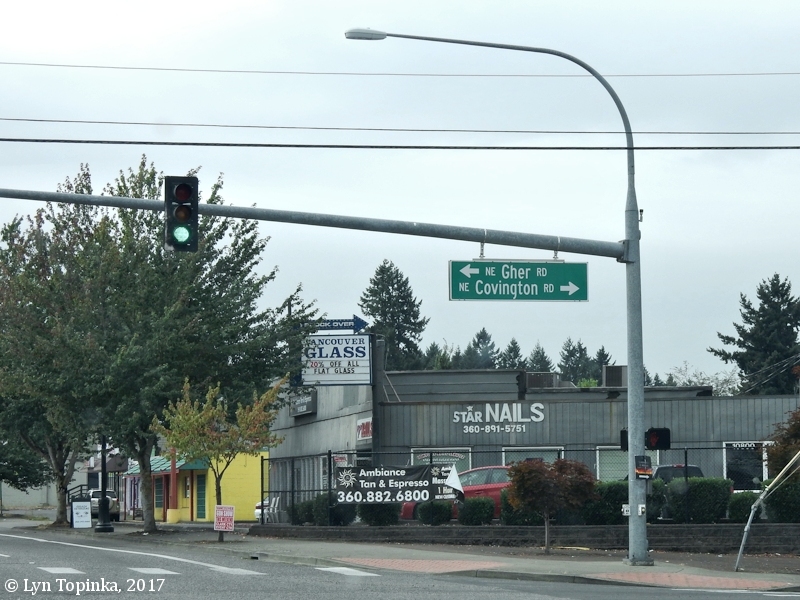 Click image to enlarge Gher and Covington at junction with Fourth Plain, Vancouver, Washington. View looking to the northwest. Image taken July 4, 2017. Street Car and Auto Collide. "VANCOUVER, Wash., July 22. -- (Special.) -- A car on the Sifton Interurban line collided with an automobile at the grade crossing at Gehr station last night. The only occupant of the automobile was not injured." Source: "Morning Oregonian", July 23, 1919, courtesy Historic Oregon Newspapers Archives, University of Oregon Libraries. The Vancouver to Orchards to Sifton Streetcar Line officially opened to Sifton on June 30, 1910. "Sifton ... In 1908, this area east of Orchards was named for Dr. Sifton, of Portland, who was a dentist and an important stockholder in the local power company." "... It was decided to name the community after the company's president, Sifton. The streets were laid out and named after various board members: Kerr, Hall, Alvadore avenues, and Moulton, Russell and James streets." Click image to enlarge NE Kerr Road and NE 134th Avenue Signs, Sifton, Clark County, Washington. Image taken May 25, 2017. 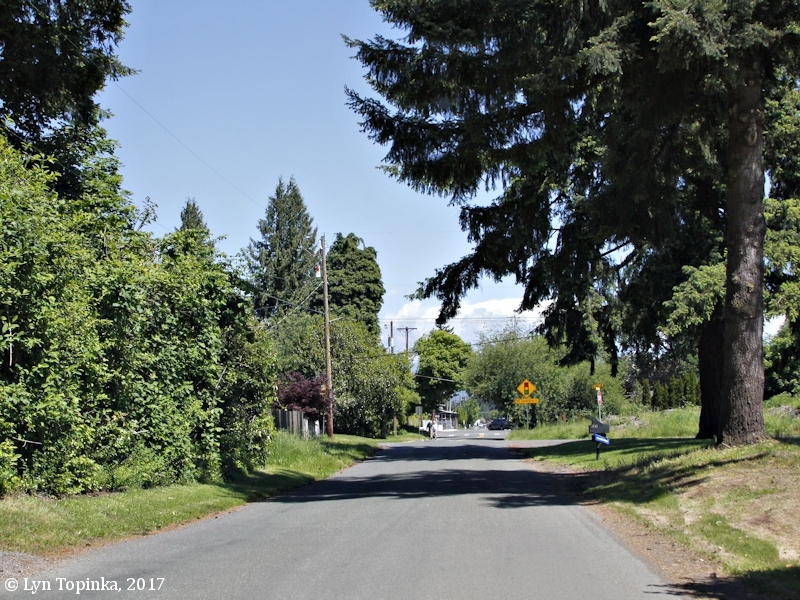 Click image to enlarge NE Kerr Road, looking east, Sifton, Clark County, Washington. Image taken May 25, 2017. Click image to enlarge NE Kerr Road, looking west, Sifton, Clark County, Washington. Image taken May 25, 2017. 3) "Morning Oregonian", courtesy Historic Oregon Newspapers Archives, University of Oregon Libraries, 2017. 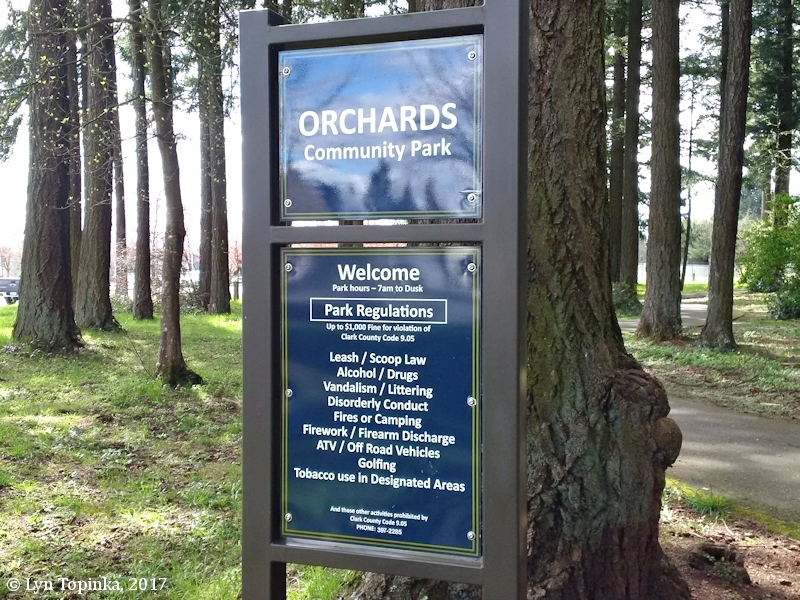 Vancouver Trolley System Starts for Orchard. Completion of Railway to Sifton, Seven Miles Out, Is Set for November 15. A piling bridge now being constructed is the largest on the extension, and is 864 feet in length and about 75 feet from the ground at the highest point. The bridge spans Burnt Bridge Creek, a quarter of a mile outside of the city limits, and the same distance from the present terminus of the streetcar system. It is being constructed by W.D. Smith, the contract price being $8000. A line to Orchards a few months ago was only a dream, and many laughed at such an idea, but the people along the right of way donated enough ground for a right of way, and also gave a bonus of $10,000. The moment that the bonus was assured work on the line started, and a large force of men has been busy since, clearing the right of way, grading and laying ties and steel. The company predicts that the line will be a paying proposition from the first year. The extension taps a rich farming and fruitraising country and many persons living in the city are buying small farms and acre tracts along the line, and will live there and carry on their business here." Line to Sifton Completed for Six Miles From Vancouver. The bridge across Burnt Bridge Creek has been completed at a cost of $8000, and much grading has been done on the right of way from the Jaggy road to Sifton. Between Orchards and Sifton, one mile, the line is graded and the ties laid. A regular schedule will be established in April on the two and one-half miles completed to the Jaggy road. The line will be completed to Sifton soon. Thirty men are being employed by the company. When completed, this will be the first suburban electric line in Clark County, or Southwestern Washington." Public Service Commission Grants 3-Cent Rise to Power Firm. "OLYMPIA, Wash., Dec. 15. -- (Special.) -- The public service commission today ordered into effect December 20 increased street-car fares in the city of Vancouver. The rise was asked by the North Coast Power company. The new tarriff increases single fares in the city to 10 cents from 7, with commutation books of 11 tickets for $1. Changes in the price of commutation school tickets as noted in the new tariff follow: Between Vancouver and Falk changed from $4 for 44 rides to $5.70 for 50 rides; to Stapleton, Sparks, Jaggy and Roney, from $5.75 for 44 to $7.70 for 50; to Bonzo, Hartfield, Parkway and Orchards, from $8 for 44 to $10.35 for 50; to Gehr and Sifton, from $9.90 for 44 to $12.50 for 50; in the city of Vancouver, from $1.75 for 35 to $3.50 for 50. The commission ordered that ll school or script tickets sold before December 20 be honored until used." Source: Morning Oregonian, December 16, 1920, courtesy Historic Oregon Newspapers Archives, University of Oregon Libraries, 2017.